Trucks and tractor-trailers transporting unsecured heavy loads are a serious hazard on the roads in Massachusetts. Commercial trucks towing unstable construction equipment and supplies, tires, mobile homes and automobiles are often in the news for causing accidents. Unsecured truck loads have caused several fatal accidents in the Boston area. 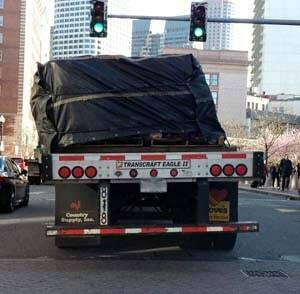 In February 2016, a school teacher driving through Boston was tragically killed, when a 200-pound manhole cover hit her windshield in the O'Neill Tunnel on I-93. Just weeks earlier, a driver was killed on I-128 in Lexington when an unsecured tire hit his vehicle. Our attorney spoke to The Boston Globe about what may have gone wrong to cause this accident. A 2004 study by the AAA Foundation for Traffic Safety found unsecured loads were responsible for 25,000 auto accidents each year nationwide, resulting in 80 to 90 traffic accident deaths. The majority of truck accidents involving unsecured loads are caused by trucks with unsafe tire treads, garbage debris from waste haulers, lumber and construction supplies. These numbers have likely increased in recent years. These accidents can happen any time of the year. When equipment such as Bobcats, backhoes, tires and front-end loaders break loose from a trailer bed, they can hit other vehicles or rollover into the roadway with force. Many of these car accidents happen on the highway, where vehicles are traveling at high speeds. Any time an object breaks free from a moving vehicle, there is a likelihood of injury. It is not just workers and construction vehicles involved in these accidents. In July 2017, a 12-year-old girl was walking in Mashpee and hit by an inflatable raft which fell off a boat trailer. Because the raft was not properly secured, she suffered a serious head injury and had to be transported to a Providence hospital by medical helicopter. Driving accidents involving unsecured loads may occur when truck drivers are poorly trained, speed, fail to properly tie down equipment or do not stop regularly to check their loads. Motor vehicle accidents may also result when trucks and tractor-trailers are not properly maintained. Other times, roads are not properly maintained and roadway defects contribute to an accident. Massachusetts utility companies, construction contractors and other businesses have a responsibility to make sure their drivers are operating trucks and tractor-trailers safely. When they fail to do so, companies can be held liable. If you have been injured in a car accident, it is critical that you speak to an experienced Boston car accident lawyer to learn your rights. You may be entitled to recover damages such as lost wages, past and future medical expenses and pain and suffering. In wrongful death cases, you may also be awarded punitive damages. Massachusetts has a Statute of Limitations governing how long you can file a personal injury claim so it is critical to contact a Massachusetts car accident lawyer immediately. For a free legal consultation, contact us at 800-379-1244 or 617-723-7676 or use our contact form.